Welcome to Green's Jewelry Rewards®! What Is Green's Jewelry Rewards® and Why Should You Join? Green's Jewelry Rewards® is a unique program that rewards you every time you visit us. For every dollar you spend, you earn points towards FREE Loyalty Certificates from Green's Jewelry. You get A FREE $25.00 Off Your Next Visit just for joining! For every 1000 points you accumulate, you will automatically receive a $25 loyalty certificate to redeem on your next visit. Most purchases earn 1 point for every dollar spent—some promotional purchases may earn more. Best of all, there is no limit! You can expect your Welcome Postcard of A FREE $25.00 Off to arrive in 3-5 weeks from the date you signed up. Please keep your eye out for a large, full color postcard that will arrive at the address you provided on your enrollment form. If 5 weeks have passed from the date you signed up and you still haven’t received your Welcome Postcard, please click here to send us an inquiry on your account. Each time you visit Green's Jewelry, please be sure to provide your Royalty Rewards® Membership Card, or Smartphone App to your server when paying for your bill. You will earn 1 point for every dollar spent—and some promotional purchases may earn more. For every 1000 points you accumulate, you will automatically receive a $25 Award Certificate in the mail within a few weeks. 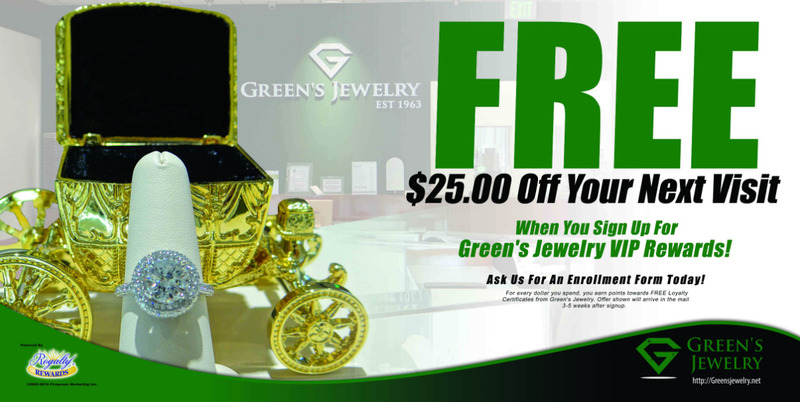 Once you receive this, you can use the $25 Award Certificate during your next visit to Green's Jewelry.